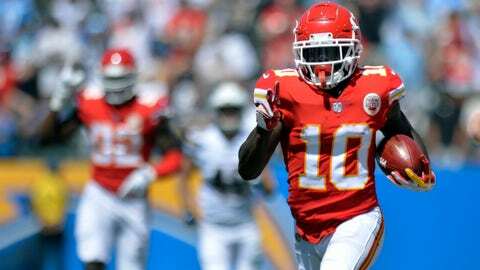 Tyreek Hill returns a punt for a touchdown against the Chargers in the Chiefs' season opener. ALAMEDA, Calif. — Oakland Raiders punter Johnny Townsend is plenty thankful he doesn’t have to cover Kansas City‘s Tyreek Hill as a defender. Dealing with Hill on special teams is challenging enough as is, even if for only two or three plays a game. Hill is sixth in the NFL with an 11.6-yard average. He had a 91-yard punt return for a touchdown in the opener against the Los Angeles Chargers on Sept. 9 that remains the longest return in the league this year. That’s a significant dip from his rookie season, when Hill had a 15.2-yard average, but that’s largely a result of teams no longer kicking the ball in his direction or preferring to pin him to a side, something Townsend said the Raiders definitely will attempt to do this week. “Just trying to shrink the field as much as we can and not give him the field to run to is going to be really important,” Townsend said. “As long as we can execute in that aspect, I think we’ll be OK. It really is kind of a test for yourself as a punter, especially knowing how successful he’s been in the NFL as a return man. Townsend has had mixed results in his rookie season. A fifth-round draft pick, Townsend is averaging 43.5 yards but has had three games in which he failed to average more than 38 yards.